It was a moment few had anticipated. For the first time since a border war in the 1990s opened a feud between Ethiopia and Eritrea, leaders of the two nations embraced on an airport tarmac on Sunday, hinting at a new era for the two countries. Ethiopia’s prime minister, Abiy Ahmed, led his country’s first state visit to Eritrea since the war broke out in 1998. He was greeted in Eritrea’s capital, Asmara, by President Isaias Afwerki, who has held power since his country gained independence from Ethiopia. Hours later, the two leaders sat for a meeting that they said would “set a tone for rapid positive changes.” Sunday afternoon, direct telephone lines were restored between the two countries for the first time in two decades. “History in the making: the pictures say it all,” said Eritrea’s minister of information, Yemane Gebremeskel, in a post on Twitter. Mr. Abiy, 41, surprised his nation last month when he announced that Ethiopia would “fully accept and implement” a 2000 peace deal that was supposed to end the border conflict with Eritrea. More than 80,000 people have died in the war, according to some estimates, and the Ethiopian prime minister was among the thousands who had fought on the front lines. In a speech to a delegation of Eritrean diplomats visiting Ethiopia last month, Mr. Abiy promised stronger diplomatic and social ties between the two countries. The neighbors will celebrate the Ethiopian New Year together in September, he said, and his nation’s airline will resume flights to Eritrea. His overtures, and his state visit, were welcomed by residents of Asmara on Sunday. They took to the streets waving palm fronds and the flags of the two nations. 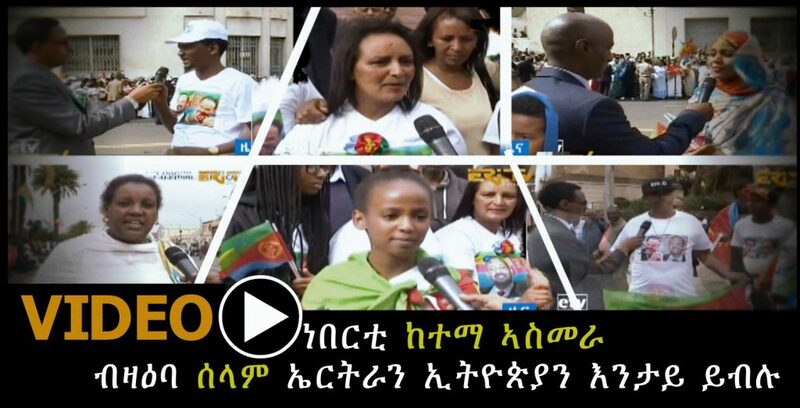 Videos posted on social media showed Eritrean women signing for peace along the city’s main boulevards. Political analysts expect negotiations to include the inauguration of embassies in both capitals and the resumption of trade between the two countries. Much work is needed to demarcate the border between the two nations and to arrive at an equitable deal that would allow Ethiopia to have access to a key Eritrean port, they said. “I had argued that the port should be given back to Ethiopia, but now I think we can have a solution that benefits both countries,” said Yacob Hailemariam, a lawyer in Addis Ababa, the Ethiopian capital. “Both countries will, of course, pursue their self interest, but this is a promising start,” he said. The state visit on Sunday is the latest among the changes that the Ethiopian prime minister has begun in a series of surprise announcements since April. His government has released prominent political prisoners and given amnesty to those charged with treason and other political crimes. The second-most-populous country in Africa, Ethiopia is also planning to sell parts of its state-owned enterprises, including the national airline, a move that its ruling party had opposed for decades. Lasting peace with Eritrea may well be among the defining moments of Mr. Abiy’s leadership of the country. The “no war, no peace” stalemate between the two countries, coupled with a government crackdown on dissent, has contributed to Eritrea’s economic and social isolation in recent decades. Thousands of its young and able-bodied citizens had fled the country, choosing treacherous routes along the Sahara over military service at home. At the height of Europe’s migration crisis, Eritreans were among the largest group landing on Mediterranean shores. The United Nations estimates that nearly 170,000 Eritrean refugees live in Ethiopia.